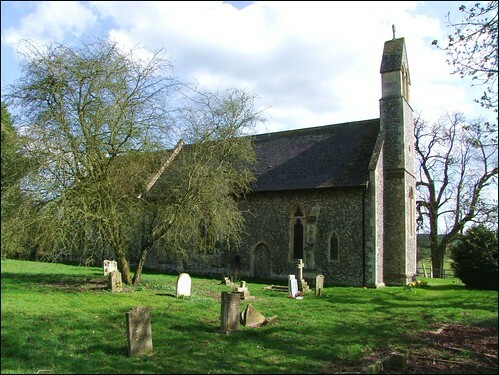 More than a few Suffolk churches are stuck out in the middle of the fields, and St Mary is not unusual in having no proper road leading up to it. What makes it rather different from many of the others is that it sits politely in the grounds of Langham Hall, just outside of Stowlangtoft, for all the world like some exotic outhouse, with the sheep ranging peacefully around its walls. The church sits beside a public footpath, and access from the road is through a five bar gate; but there is no noticeboard, and the church cannot be seen from the road, so an OS map is helpful. I've visited this place several times over the years, and I am afraid that, if your experience is anything like mine, you will reach the church to find that it is locked, and there is no sign that the building is in use for anything. I saw no notices to give me details of services or contacts, and there was no keyholder address, of course. To all intents and purposes this might as well be the private chapel of Langham Hall. It was only because I had seen the service sheet at nearby Hunston that I knew this place had not been entirely abandoned. The nave is the work of Edward Hakewill, who resisted the temptation to build his trademark north aisle here, and the chancel and bellcote are also 19th century. So is there actually nothing worth coming to seeing here? Well, not quite. Apart from the delicious setting, the church still contains many of its original fittings, and the rood screen has a most unusual feature. The decorative effect along the top is actually the former western parapet of the rood loft, moved back to give a castellated fringe to the screen. 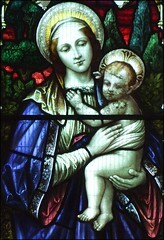 There is a good Madonna and child set in a lancet on the north side which I photographed through the windows - but I had to be careful, because the glass of the south side windows is in a terrible condition, the leading breaking up and the lozenge panes coming away, which should give cause for concern. One push and it would have given way. Churchwatch, the charity, tell us that churches which are kept locked all of the time are more likely to be vandalised, more likely to be broken into and even more likely to have something stolen from them. The shabby condition of these windows does not bode well for the future. By the path, a garden ornament cemented to a tombchest top appeared to be dancing on the graves. postscript: Charlie Blackwell, churchwarden of Langham, writes: The local PCC and the village of Langham take great pride in the continuance of St Mary's as an ongoing church for religious services, baptisms, marriages and funerals. Langham has no shop, pub or village hall so the church is the one area in which the village both support and come together. Being a small hamlet, raising funds for the annual levy and repairs is a serious focus for the village efforts through church fetes, car boots, coffee mornings and the like. Furthermore, as a place of worship, the church used to be permanently open to all passers by to visit. Unfortunately in the last 5 years, as is endemic of our present society, the church has been vandalised twice and even worse was broken into and used as a place for a teenage lovers ' tryst' ( no more explanation needed) with all the kneeling prayer stools used as a mattress, alter cloths for blankets and all the candles moved ,lit and wax spilled everywhere. Hence the church is now locked for safety and the keys held by the church wardens, available on demand.